Window blinds come in an endless range of colours and finishes, but at home we must consider the way they are operated and how safe the cords are. 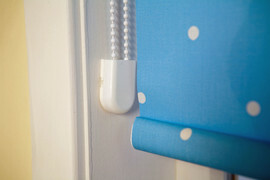 There are blinds to suit every application and many are now available with cordless or concealed cord operation making them ‘safe by design‘. All other designs can be made safe as well.